We found this little guy in a handicapped parking space in front of the NJMC administration building in DeKorte Park earlier this week. We moved it to the building's grounds several feet away, out of harm's way, and then let it be. When we checked an hour later, it was gone. 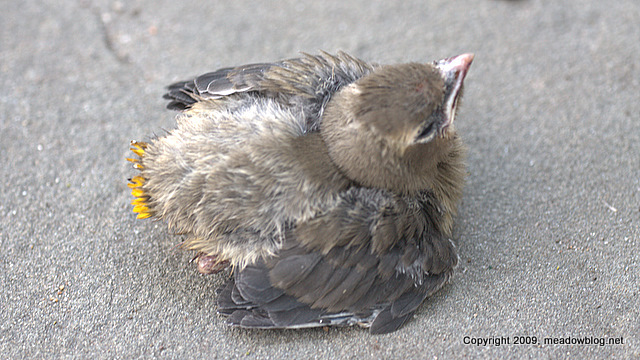 We are thinking that this is a baby Cedar Waxwing, given the yellow on the tail feathers. If anyone has another idea, please let us know. Cedar Waxwings have been zipping around DeKorte for a while, and we photographed several adults about an hour earlier. Click "Continue reading" for a shot of an adult Cedar Waxwing taken earlier this week.